Limoncello is a social sipping drink. Use small cordial size glasses. When made with Everclear, it is sweet, lemony super strong drink. The first sip will open your eyes! The second will warm your body. The subsequent will make you silly happy. Warning! You may find yourself with the urge to strip nekkid and get "intimate" RIGHT NOW. When made with Vodka, it is about half as potent, half as good but a bit easier to drink. Limoncello also makes nice drink mixed in a glass tumbler filled with ice and half Limoncello and half club soda. 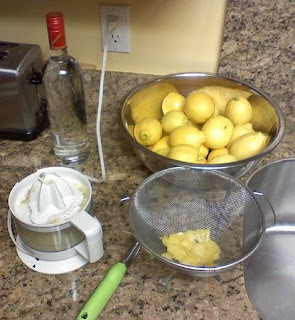 The basic ingredients are lemons, hooch, water and sugar. - Fresh lemons from my tree. Lots of them. 15 or 20 for sure. Pretty Yellow ones that smell all lemony. - 2 bottles of Everclear grain alcohol. I use 151 proof but 190 proof rocks! You can also use a clear grain vodka. 80 + proof. 90 is better. - 2 quarts water. Clean fresh water. Filtered water. If you like your tap water, that works too. 1) Carefully peel the yellow rinds off the lemons. Be sure to get as little of the white stuff as possible. The white stuff is bitter and pulpy. We are making some fine hooch here. Don't taint it with the icky stuff. 2) Dump the rinds into a large sealable pitcher or jar. Glass is best but I use plastic lock N lock. 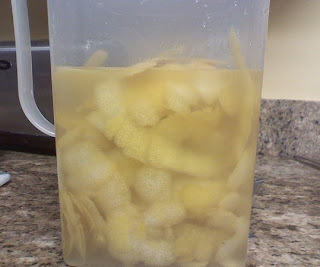 3) Pour the Everclear/Vodka into the container making sure to cover the rinds. Close lid tightly and shake. Save the bottles. Clean them and store them. You actually need 4 bottles. You have a couple weeks to prepare. I use a 1.5L Vodka Bottle and the two 750ML. 4) Place it in the back of the fridge and forget about it for at least two weeks. If you are so inclined, shake it every day or two. After two or more weeks have passed make the simple syrup. Note, Everclear will ignite like a bomb! Keep it away from heat sources and flames. 1) Heat 2 quarts of water to 105 degrees (kinda warm but not hot. Stir in the sugar and stir until it completely dissolves. Let cool completely. DO NOT CONTINUE UNTIL THIS HAS COOLED!!! 2) Strain Everclear /Vodka and rind mixture through a fine strainer. The liquid should be yellow or yellowish from the rinds. 3) Combine the Everclear/Vodka with the sugar water and shake like hell. 4) Pour into the bottles, seal the bottles and put in the freezer. As a tip, I also like to filter it at the end before bottling. Otherwise you'll get a lot of filmy residue after it sits in the bottle for a while. My additional tip is to drink it often so the ick does not have a chance to build up. Time to check the Limoncello. Three weeks in the fridge!